Led by experienced professionals from NACEP-accredited concurrent enrollment programs, this in-depth workshop features strategies for implementing NACEP’s national standards that enhance the quality of concurrent enrollment programs. key high school partners, such as a school district superintendent, district or school-based concurrent enrollment coordinator, or high school principal. 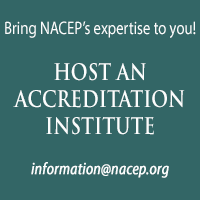 Resources from NACEP's Accreditation Institute are restricted to individuals who have attended an Institute previously. Please contact Jennie at jpatteson@nacep.org if this applies to you and you need the password to access these materials.